Nothing good happens between the hours of 7-11. 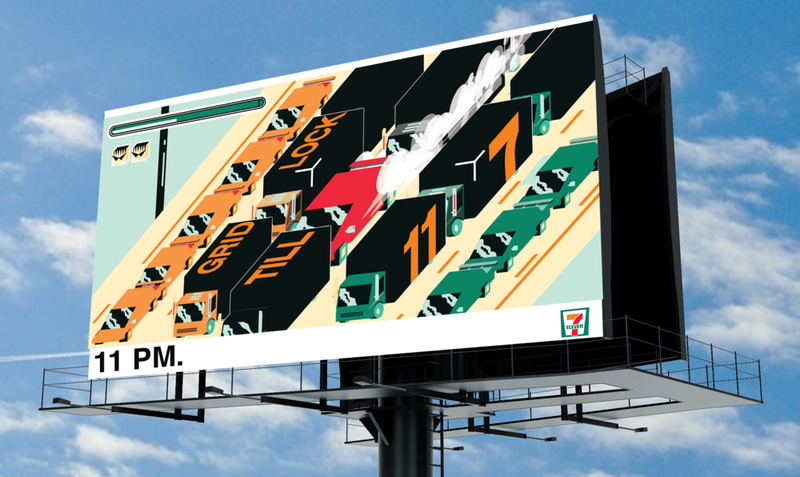 That's why we decided to give the 7/11 brand an alter ego: 11/7. Ads would be placed on digital billboards, asking consumers to check back at 11 p.m. for the true message. Other billboards would appear in traffic-heavy areas, with different stories being told depending on the time of day. The after hour taxi, available for an increased price after 11 p.m. in select U.S. cities. "Fuel" stations that are available after 11 p.m. Bring a container of choice, purchase tokens that release a select amount of slushy inside the 7/11 store, and then go back outside and fill their containers with slushy using a fuel nozzle. Copywriter: Some prick named Caleb.